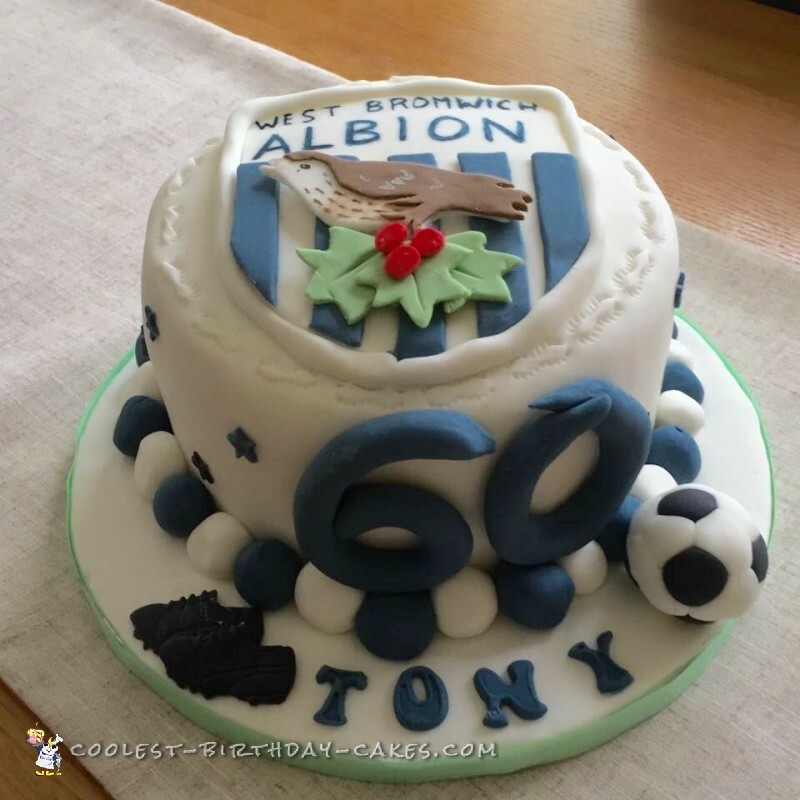 My brother in law was to become 60 he loves his football and he supports West Bromwich Albion in England. 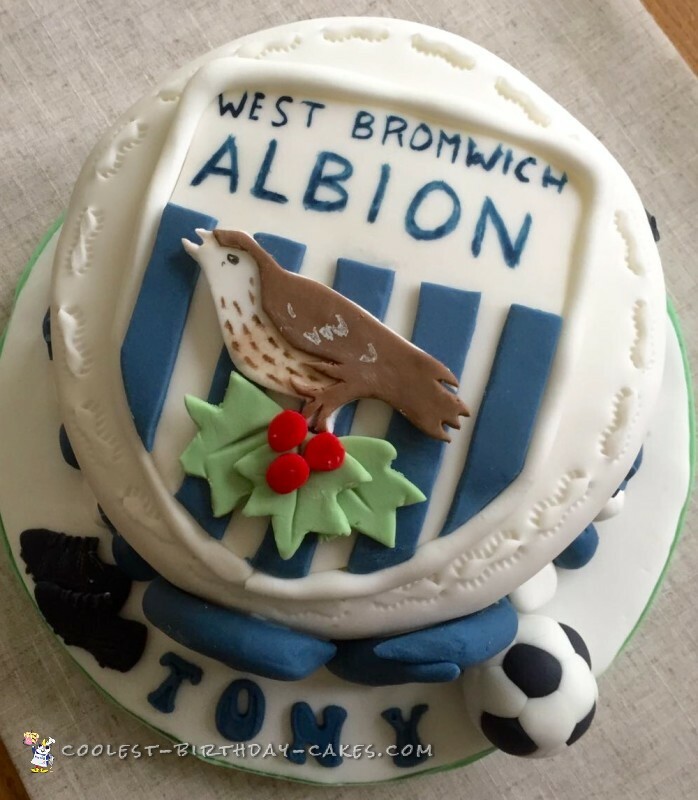 So I decided to make him a West Bromwich Albion badge cake. I firstly had to make sure I could make the West Brom badge. I cut the bird out of the template in white and then I cut the brown of the bird out of the template. Then I cut this out of the brown icing and attached this to the bird. I then set this aside on a flat surface to harden. I now cut out three leaves in green modelling paste and made three berries out of red fondant. These were set aside to dry out. I now attached the bird to the badge using royal icing. I then attached the leaves and the berries. Now using vodka and navy food colouring paste, I painted West Bromwich Albion onto the badge to finish it off. Using my mold i made two football boots and set them aside. I baked the cake a 8″ round 3 layer cake. After letting it go cold, I then filled with buttercream and jam and then covered in buttercream. Then let it chill in the freezer. I rolled out some white fondant icing and when the cake was chilled I covered the cake and the cake board. I then crimped the top edge of the cake I then attached the badge to the top of the cake. And then the blue/white balls all around the edge of the cake. I set the cake aside over night to harden. The next day I added the name to the cake board and using royal icing I attached the 6 and the 0 I the attached the football boots and the football to the cake board. He loved his West Bromwich Albion Badge Cake!